In essays by patients, colleagues or family members, these nurses and 24 others were cited for going above and beyond the line of duty by offering life-changing compassion, expertise and helpfulness. 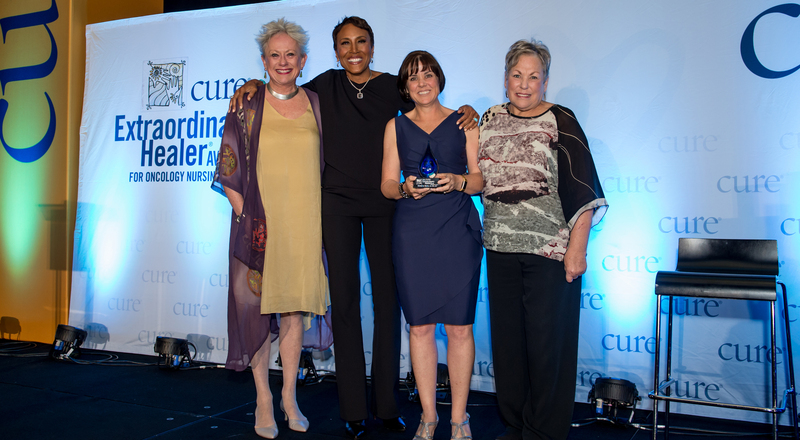 They don’t all work in pediatric units, but the three oncology nurses honored in CURE’s 2018 Extraordinary Healer contest have each gone the extra mile to help young people and their loved ones through some of their most difficult moments — while also striving to make sure that their colleagues and institutions are prepared to do the very best they can for patients. An audience of 1,000 was on hand to learn that nurse navigator Christine Stone, M.S.N., RN, OCN, of the Life with Cancer program at Inova Schar Cancer Institute, in Leesburg, Virginia, had won the award. The announcement came during a dinner and ceremony in Washington, D.C., held in conjunction with the Oncology Nursing Society (ONS) Annual Congress. The event featured a keynote address by Robin Roberts, co-host of ABC’s “Good Morning America” and a two-time cancer survivor. As a nurse navigator, Stone shepherds patients through the cancer journey, from diagnosis to survivorship, and through the Life with Cancer program, she provides those patients and their families with wellness, education and support programs. She has been involved with multiple quality improvement projects across her institution. At the Extraordinary Healer event, her fellow oncology nurses were moved by the story of how she helped a dying woman celebrate a milestone with her teenage daughter by setting up a hospital bedside celebration of the girl’s high school graduation, complete with speeches by the school’s principal and some teachers. Stone won a weekend for two at the Nobu Eden Roc Beach Resort and Spa in Miami Beach, Florida. The essay about her will be featured in an upcoming issue of CURE. Elizabeth Davis, B.S.N., RN, CPN, of St. Jude Children’s Research Hospital, in Memphis, Tennessee, has made a big impact during only five years as an oncology nurse. She brought the Baxter Animated Retching Faces (BARF) scale to her institution, making it easier for children to communicate their nausea levels, and is involved in a number of projects, councils and committees aimed at soliciting and fostering ideas that can improve care. She has also spearheaded charity drives. When interacting with her patients on the Solid Tumor Inpatient Unit, Davis strives to give them the best days they can possibly have. Jackie Miller, B.S.N., RN, OCN, has been a member of the oncology unit at the Penn Medicine Virtua Cancer Program in Voorhees, New Jersey, since its inception. She manages a program the hospital oversees — the New Jersey Cancer Education and Early Detection Program, which provides health screenings for uninsured residents of two counties — and founded Camp Oasis to help provide emotional support for the children of southern New Jersey residents diagnosed with cancer. Mistress of ceremonies Kathy LaTour, co-founder of CURE and a survivor of invasive breast cancer, agreed that the accomplishments of the winner and finalists exemplify the contributions of oncology nurses everywhere. Roberts, who has reported news around the globe and received honors including the Walter Cronkite Award for Excellence in Journalism, was cared for by oncology nurses after she was diagnosed with breast cancer in 2007, and again five years later after a therapy she took to treat that disease led to the rare blood disorder myelodysplastic syndrome (MDS). She continued to appear on the air and talk about her journey throughout her treatment for breast cancer and worked as much as she could during her therapy for MDS, although she was quarantined for approximately six months following a bone marrow transplant given by her sister. By sharing her experiences, Roberts inspired increases in the number of people undergoing breast cancer screening and donating bone marrow for transplant. She and her colleagues received one of her industry’s highest honors, the Peabody Award, for using her MDS journey as a teachable moment. Roberts explained to the crowd of nurses how she’d been at home, stretching, in 2017 when she found a lump in her breast. She had just been to the funeral of a friend, film critic Joel Siegel, who had died of colon cancer, and remembering how strongly he had advocated for early detection, so she made an appointment to see a doctor. Roberts credits the nurse in the room at that appointment for pushing her to mention the lump. The nurse could somehow tell she was holding information back, and encouraged her to reveal it by simply giving Roberts a look. The woman nodded, satisfied, when Roberts finally asked the doctor to check the lump. Roberts revealed her diagnosis with triple-negative breast cancer on “Good Morning America,” taking her mother’s advice to “make your mess your message” and become a voice for others facing the disease. After she recovered, Roberts was thrilled to get back to her life and work — which included driving the Pace Car for the 2010 Indianapolis 500 and writing a song with India Arie. But extreme fatigue led to some doctor’s visits and her diagnosis with MDS. Nurses helped her along that path, too. Roberts remembers the surreal feeling of undergoing chemotherapy in preparation for her stem cell transplant and watching a doctor she didn’t know explaining her condition on TV — more comprehensively than her own oncologist had. After everyone else had left the room, her oncology nurse asked if Roberts wanted a phone number for the doctor — who worked for a competing hospital. Before long, that doctor was part of Roberts’ medical team. She also recalled the hospice nurse who helped her have a final conversation with her mother, and the oncology nurse who was at her bedside after her bone marrow transplant just days later, reviving her when she felt herself slipping away. To Roberts, the voice calling her name sounded like her mother’s, but it was actually the oncology nurse who brought her back to consciousness. The winner and finalists were each nominated by colleagues who recognized their expertise and skill. They joined more than 1,000 nurses nominated since the inception of the Extraordinary Healer Award for Oncology Nursing in 2007. Finalists and essayists honored have included men and women, adults and children, representing a variety of cancer centers and hospitals in a host of states. Stone was nominated by a fellow nurse, Deborah A. Boyle, M.S.N., RN, AOCNS, FAAN, of Advanced Oncology Nursing Resources in Huntington Beach, California. Davis was nominated by a colleague at St. Jude, Anna L. DeVine, B.S.N., B.A., RN, CPN. Likewise, Miller was nominated by a colleague: Randi Solden, B.S., RN, OCN, of Penn Medicine Virtua Cancer Program. The event was sponsored by Amgen and its Breakaway from Cancer program. Breakaway from Cancer is a collaboration between Amgen and four nonprofit organizations that connects patients with free resources, from prevention through survivorship. The program was also sponsored by Merck, which has developed more than half a dozen cancer medicines and is focused on inventing more. Claire Mulhearn, head of oncology communications for Merck, said she is familiar firsthand with the work of oncology nurses because she was treated for triple-negative breast cancer.